After a year of planning, I’m happy to report that our 1:1 computing initiative is on the move! In the last two weeks, all of our elementary schools have received Samsung Chromebooks for 5th grade classrooms. The carts are still being assembled, but the Chromebooks came out of the boxes ready to go. Over the next month, high schools and some middle schools will also be receiving Chromebooks. Boots up in 8 seconds – This is a big time saver in the classroom. Students open the Chromebook, sign in, and they’re ready to work. Students can also close the lid without worrying that they will have a long boot up process when it’s time to work again. No management issues for the classroom teacher or the IT department – Automatic updates and no viruses. Teachers can teach instead of managing equipment. The total cost of ownership for a Chromebook is much lower than the total cost of ownership for a laptop. Battery – The Chromebook battery easily lasts for 8 hours. Management Console – The IT Department can deliver apps and set restrictions using the Management Console which is built into the Google Apps for Education administrator dashboard. 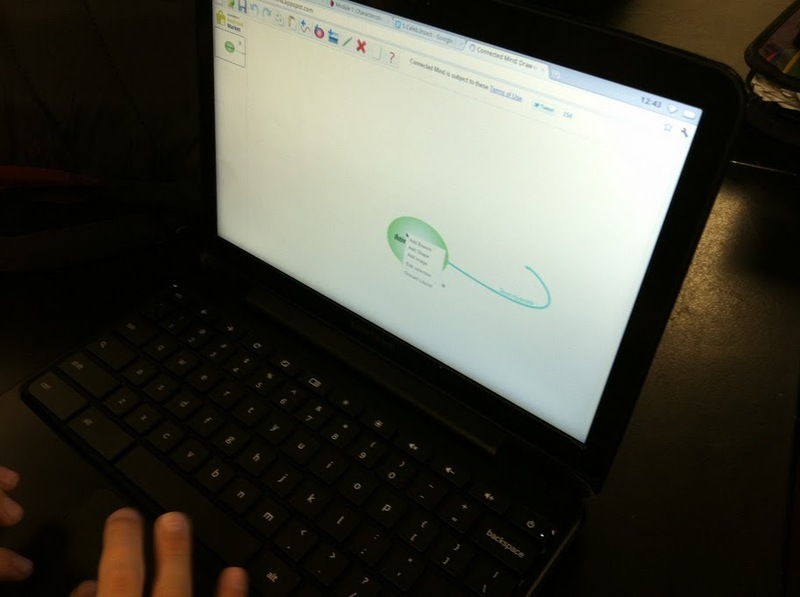 The Cloud – The Chromebook allows students full access to Google Apps for Education. Students can create ePortfolios using Google Sites, chat with their teacher, collaborate with other students on a Google Doc, access Picasa web albums, blog, and a host of other things. With Ericom, our students can also access our district cloud. Apps – The Chrome Web Store is growing every day with great free apps for education. Many of the apps can be used offline if needed. Students don’t need an additional account to download and install apps. Physical Keyboard – The keyboard has been modified to include a search key and a reload key. The physical keyboard makes it easy for a student to be productive. USB ports, memory card slot – It’s easy for a student to insert a flash drive or SD card and upload files or photos to Google Apps using the Chromebook File Manager. Webcam – The webcam works well for Google chat. Flash – Until more vendors create HTML5 sites, we can still access educational content through Flash sites. My list could go on, but the most important thing about the Chromebooks is that they will provide our students with meaningful experiences and 21st century skills that will prepare them for a great future! Students in our pilot group were collaborating, creating, and publishing on the first day that they started using the Chromebooks. Stay tuned for updates on how Chromebooks are being used in classrooms.